So, one of my incredibly nerdy hobbies is collecting etiquette books from first half of the twentieth century, because how else would I know how to entertain without a maid (yes that’s a real chapter from one)? And seeing as how I possess a 1948 copy of Vogue’s Book of Etiquette (thank you, eBay), I figured I had to share some of the fashion tips from Ms. Millicent Fenwick, who provides everything a lady of the late forties needs to know about country day clothes, country evening clothes, town clothes, traveling clothes, riding clothes, and, of course, shooting clothes. 1. Suits of mixed tweeds with brown, gray, beige or gray-green as the basic color. 2. Shirtwaists of plain white linen, cotton or silk, with long or short sleeves, round or V-neck, and turned-down collars; or simple blouses, with a round or high neck, with a plain bow. 3. Extra skirts of corduroy, whipcord, tweed or heavy gray flannel, cut with enough fullness for walking. 4. Sweaters, either pull-over or cardigan, of shetland or cashmere yarn. 5. Overcoats of tweed or rough woolens, fur-lined or not; camel’s hair coats. So kind of like a J. Crew catalog. However, Fenwick cautions heartily against dressing too “city” when in the country; for instance, “Colors that look acidly synthetic; as magenta, fuchsia, chartreuse, or hard aquamarine-blue; colors, such as dark blue and black, which are apt to look citified.” Apparently, the trend of black being a “city” color is nothing new for modern fashion. According to Fenwick, “in a very big city, dark clothes are the basis of every wardrobe”. 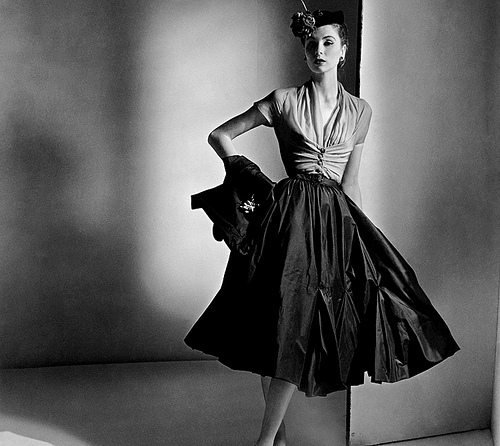 However, for the younger Vogue reader in the 1940’s (or for the mother who was purchasing her clothes), it was a rule that “No black dresses in the daytime (girls under twenty do not, as a rule, look well in black in the daytime, but some black evening dresses can be very becoming)”. My favorite tips from Fenwick are the very specific costumes that went along with “the sporting life” that still continued throughout the 1940’s. Although this sort of sportswear became somewhat obsolete by the 1950’s (when suburban family life dominated fashion), during the 1940’s upper-class American traditional activities (yachting, riding, tennis) demanded the correct clothing, and demonstrate the meaning behind different costumes in daily life for that class of the population. While in modern fashion trends, aspects of these costumes are borrowed and can be worn pretty much anytime (jodhpurs, riding pants, high boots, polo shirts), in the 1940’s these garments had specific purposes and indicated what the wearer would be engaging in at that time of day. There were certain outfits for “morning shopping” or running errands, certain outfits for evening wear, certain outfits for sporting that would never be worn to do any other activities, etc. 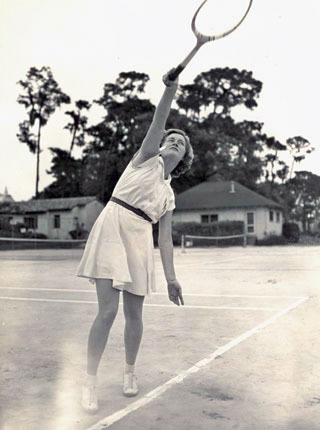 American tennis star Pauline Betz in traditional tennis whites. For instance, according to Fenwick, the biggest fashion faux pas when playing tennis is to wear colors of any kind. When sailing or yachting, Fenwick explained the specific costume to be worn on deck, but added “If one plans to go ashore anytime during the cruise, one will need a summer day dress also”, because the clothes worn on boat were not the same as those appropriate for traveling anywhere that was not a boat. The specificity of it all is kind of fascinating, and indicative of the difference between getting dressed in the 1940’s, and getting dressed now. Clearly, all of this is aimed at the readers of Vogue and not necessarily the every-day American woman. However, Fenwick’s views on appropriate dressing still deliver insight on 1940’s standards for dressing, such as the concept of the complete ensemble: suit, blouse, hat, gloves, overcoat, or what types of fabrics are strictly for evening or what colors can be worn at what time (if you wear white when you’re traveling, Fenwick hates you). Next time…the fashion leading to the 1950’s! Finally gonna do it. Thanks for checking it out, Prerna! Wow – the jacket cut on bias is so fabulous! Great post. I’m taking a course at FITNYC and have to answer a question on fashion behaviors from when my grandparents were young. This is a great help. What a fun find for you… I’m very jealous! Thanks for checking out my post. I’m glad it was helpful! 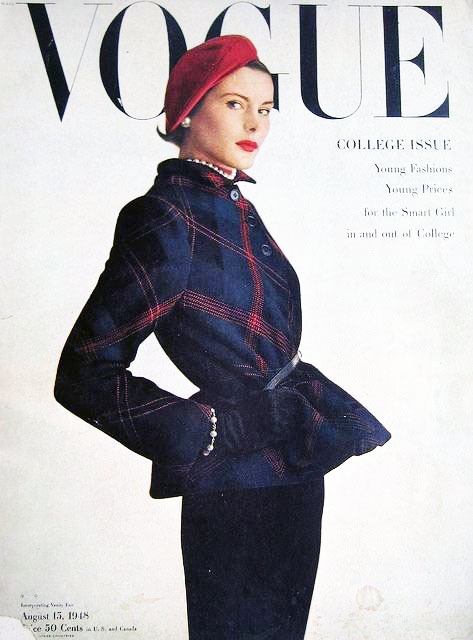 Yes, finding primary sources like these are real treasures…I’m always keeping an eye out for vintage Vogues as well for classic fashion inspiration.